The Hay Creek Valley Historical Association is a-wear’n the green!! So pick up an Irish Brogue . . . bring your clan and your appetite to a fabulous ‘Irish Breakfast buffet’ on Saturday, March 17 from 7:00 a.m. to noon. That morning Joanna Furnace, figuratively, turns green with the best Gaelic atmosphere and eating imaginable. 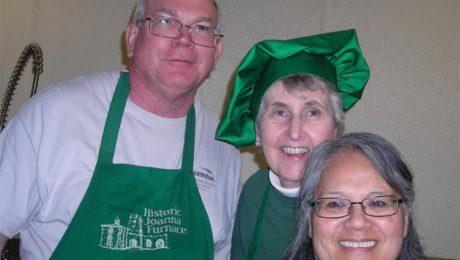 And if the food isn’t enough to draw people to the furnace, the entire buffet will be enhanced by traditional Irish music performed by HCVHA’s own Lady of Song, Phyllis Hummel. This homage to Ireland will feature a hearty, traditional Irish buffet of Pancakes, French toast, County Sausage, Homemade Corned Beef Hash, Bacon, Scrapple, Creamed Chipped Beef, Scrambled Eggs, Country Style Potatoes, Baked Oatmeal, Fruit, Coffee, Juice and more. The cost for the Buffet: Adults $9.50 Children (5-11) $4.50 Children under 5 FREE. Most of the Irish, and some Scottish songs to be heard would have been familiar to the Scotch-Irish workers at Joanna Furnace and their families in the local community. The Irish Breakfast marks the second of the 2018 season’s Saturday events, which take place on various dates from February until May. At every one of the special Saturday events, visitors have the opportunity to learn about the furnace’s history and its importance to 18th and 19th-century life in the tri-county area in addition to eating their fill. It’s the peak of apple harvesting time. 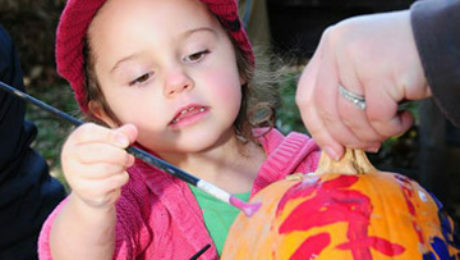 During this beautiful fall season, the Hay Creek Apple Festival offers a wonderful day with some great family fun.